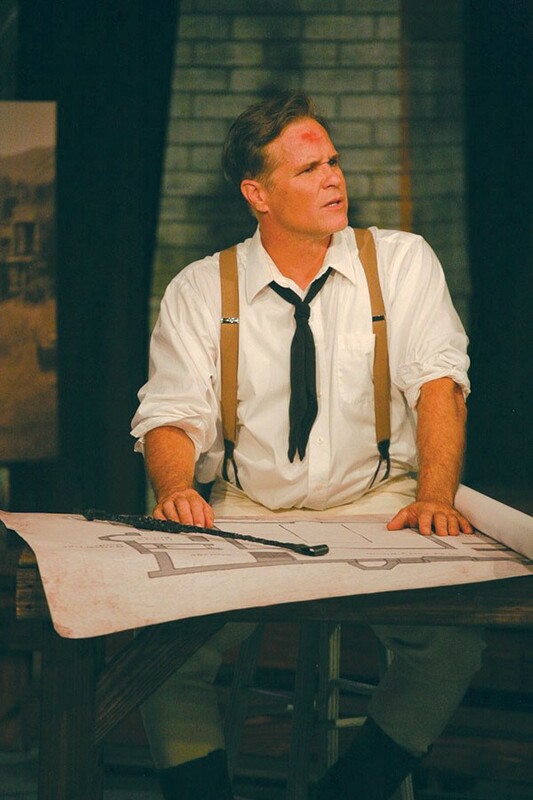 'The House That Jack Built' runs Thursday–Sunday through Sept. 25 at 6th Street Playhouse. Thursday, 7:30pm; Friday–Saturday, 8pm; 2pm matinees on Sunday. $10–$26. 56 W. Sixth St., Santa Rosa. 707.523.4185. BUILDING DREAMS Ed McCloud makes an excellent. One cannot grow up in Sonoma County without gaining at least some awareness of who Jack London was, that he wrote books about wolves and dogs, and that his home is now a state park a mere 30-minute drive from Santa Rosa. This year, the county marks the centennial of London's 1916 death with numerous events, many taking place on or around the gorgeous sprawling property he once called home near Glen Ellen. Interest should be high, therefore, for Cecelia Tichi's passionate world premiere, The House That Jack Built. Directed with resourceful tenacity by Craig Miller, the play appears alongside Charlie Bethel's acclaimed one-man telling of London's Call of the Wild, at 6th Street Playhouse. Propelled by a first-rate performance by Ed McCloud as Jack London, Tichi's play is set in August of 1913, just as London was completing construction of Wolf House, the vast rock and redwood residence he'd sunk his dwindling fortune into building for himself and his wife, Charmian (Elizabeth Henry). Few locals don't know the eventual fate of Wolf House, but that something bad is going to happen is easy to guess from all of the first-act foreshadowing about insurance and creditors. The act is anchored by a long barroom conversation between London and three old associates—boyhood pal Frank Atherton (Lito Briano), newspaper reporter Cloudesley Johns (James Rowan) and photographer—and one-time South Sea shipmate—Martin Johnson (Matthew Cadigan). As bar owner Johnny Heinold, Ben Harper is delightfully natural, all watchfulness and easy grace. But the whole first act is little more than a vigorous recitation of well-researched historical details about London, his progressive worldviews, his successes and failures, and anything else the playwright—a scholar at Vanderbilt University—felt lovingly compelled to squeeze in. The second act—highlighted by an unexpected boxing match and the climactic event that altered the course of London's life—is far livelier, but still feels less like a play than an interpretive docudrama presented to visiting tourists. As drama, The House That Jack Built, for all its charms and local significance, strains under the weight of being so aggressively "educational." That said, it's never boring, due mainly to McCloud's muscular, fully engaged performance, and to the wild excitement of London's extraordinary life.